We have updated our list of catamarans who are available for a Christmas charter in the Virgin Islands. We had to remove quite a few booked yachts or change their dates because some now have New Year bookings and we also added a few more boats to the mix. We are happy to say that there are still a good selection of yachts to choose from, ranging from a 2-person charter to a party of 10. The following charter yachts have announced a 10% discount for new charters booked from now and taking place by the end of 2018. Such a deal !!! Linda asks "Have you been naughty or nice"
Prices mentioned are for 7-night Christmas charters. We would like to welcome Catamaran Quest back to the charter fleet. They took last year off to repair damage that occurred during Hurricane Maria last September and also took advantage to make major upgrades to their yacht and systems. Look at that pretty new paint job! Charter Catamaran Qwest... Better Than New! We were anchored with Quest in the same part of Salt River in St Croix for Hurricane Maria. Chris was a tremendous help before and after the storm. Thank you, so much. 10% DISCOUNT off any charter booked to take place before June 30, 2019. Rate valid on full-board or half-board charters. 6-night minimum. Excludes holidays. Book by December 31, 2018. 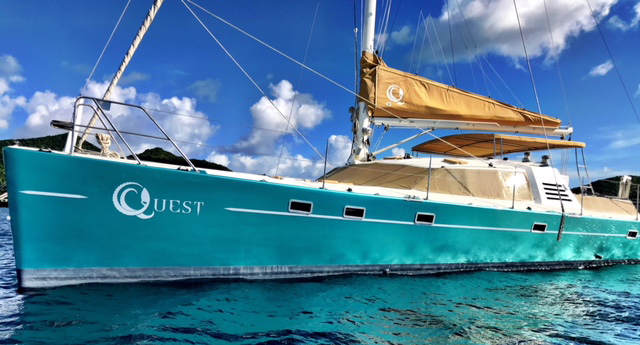 Quest is a 57-foot Simonis catamaran with an owner-operator crew of two (Chris & Nikki) and their cat, LuLu Cousteau. Quest's guest cabins are air conditioned and accommodates up to 6 guests in 3 Queen cabins, each with ensuite head (shower, sink & electric-flush toilet). Quest has a 14-foot dinghy with 40HP motor, tube, wakeboard, 2 single kayaks, 2 standup paddleboards (SUPs), snorkel gear, floating mats, fishing gear, projector & screen to view movies in salon or in cockpit, iPod dock, hammock, underwater camera, beach games, inflatable island, etc. WiFi available via boat hot spot where ATT reception is accessible, 10GB maximum per charter allowed. 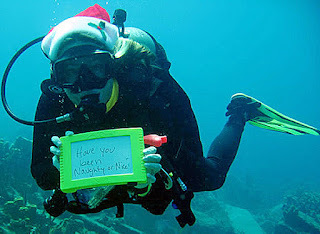 Quest has a Dive Master (Nikki). The Thanksgiving holiday in the USA is always the 4th Thursday of November. For 2018, Thanksgiving falls on November 22nd. This year, why don't you combine T-day with an all-inclusive, crewed, catamaran charter and be pampered! No cooking, no washing of dishes... Hurray! Rates mentioned below are for 7-night, all inclusive charters, in the Virgin Islands. Special Offer: Book 7 nights between November 17th and 25th 2018 and only pay 6 night rate. Special Offer: $1,000 off any charter completed by Dec 18, 2018. 6-night minimum. Special Offer: 10% off for remainder of 2018. 7-night minimum. Does not include Christmas or New Years. Special Offer: 20% off charters taking place between Nov 1 - Dec 15, 2018. 6-night minimum. 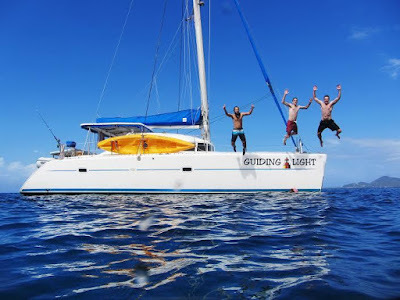 Guiding Light is a 41-foot Lagoon catamaran that offers Captain-Only charters in the Virgin Islands (winter) and Grenada/Grenadines (summer). Guiding Light accommodates up to 6 guests in 3 Queen cabins each with private, ensuite head (wash basin & manual toilet). The port aft cabin shares its head with the captain. The two starboard cabins each have private ensuite head and wash basin. There is one very large, comfortable shower in port hull that is shared between all cabins. Captain-only charters are "plus all expenses" with one crew, the captain. Captain Shane loves to cook and will prepare 3 dinners per week and bake homemade fresh bread for lunch daily, provisions at clients expense. Guiding Light has a 12-foot dinghy with 25HP outboard, tube, one 2-person kayak, snorkel gear, floating mats, boogie boards, beach games underwater camera, TV in salon, etc. The charter catamaran Guiding Light will be sailing from Grenada to Puerto Rico in mid-November and is offering a two-week "cruising experience" charter from November 9-23, 2018. 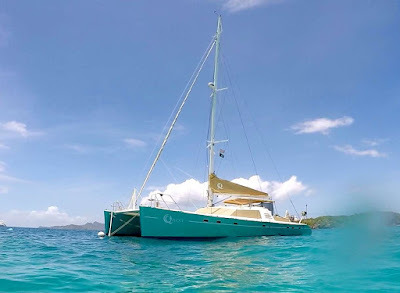 Time will be spent exploring both Grenada and the Spanish Virgin Islands and, when the weather window presents itself, we will do a blue water sail for around 3 days. This is a great way to get experience sailing. Cost is $5,000 per cabin plus clients share of food costs. Standard Rates, USVI only: $6,000/wk, captain-only charter, for up to 6 guests. Standard Rates, includes BVI: $7,000/wk, captain-only charter, for up to 6 guests. Special offer rate: $5,000/cabin, captain-only charter, for up to 6 guests, Nov 9-23, 2018. Note: Captain will cook 3 nights out of the week, and make fresh bread for lunch daily, provision at client's expense. Captain will provision for clients at cost of provisions to save clients time to enjoy their charter.